The real-life paradise of Seychelles is everything you imagine it to be. Swaying palms, tropical forests and glorious beaches greet you. Spectacular views of the Indian Ocean and native Takamaka trees are part of the unspoiled beauty of the islands. Perfectly located in Intendance Bay is Banyan Tree Seychelles luxury resort. Certainly, Seychelles is everything we dream paradise to be. Sainte Anne Marine National Park is comprised of six islands off the northeast coast of Mahé Island, Seychelles. “It faces Eden Island and four other smaller islands, so it’s very serene. There are a lot of fish and nice small, secluded beaches. You can spend a day there and feel like you are the only one on the island,” says Fabrice. “The Seychelles is a fisherman’s paradise. You can go deep sea fishing for tuna, sailfish, swordfish or dorado. Each time you go out, you can come back with at least 250 pounds of beautiful, delectable fish. It’s a fun day at sea with friends, a lot of food and of course, drinks,” suggests Fabrice. “For amateur photographers, like myself, the Seychelles is a beautiful place to take stunning pictures of captivating sunrises and sunsets. There is very little light pollution at night, so you can see the Milky Way and infinite stars,” Fabrice notes. 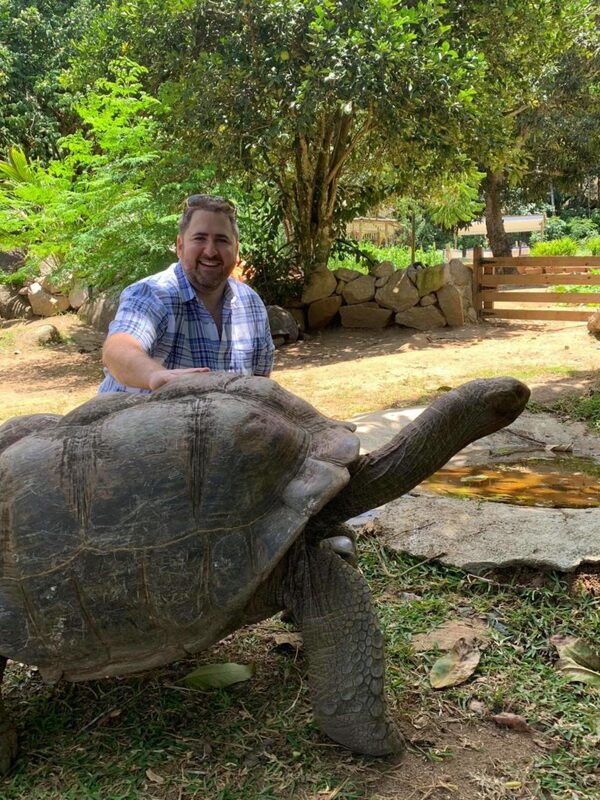 “Banyan Tree Seychelles is a homing zone for turtles to lay eggs each year. Turtle season begins in October and ends in February, when the last nest hatches and the final baby turtle crawls to the sea. You can join our Wildlife Conservation and Rehabilitation Center officers on their daily beach patrol to witness this unique experience,” Fabrice explains. Banyan Tree luxury spa is a sanctuary for the senses – a place for physical, mental and spiritual renewal. As a pioneer of the Tropical Garden Spa concept and Asia’s first upmarket oriental spa that focuses on a non-clinical and holistic approach based on traditional Eastern healing therapies, Banyan Tree Spa offers an exotic blend of ancient health and beauty practices passed down as generational heirlooms. Yoga is a part of the Seychellois culture, and there are classes available at Banyan Tree, as well as a gym. Banyan Tree has selected romantic spots across the resort for intimate couple dinners. Finally, the villas overlooking the Indian Ocean are a perfect setting for a “do-it-yourself” BBQ. The menus and dining experiences are inventive, as the variety of fresh and eclectic food seems infinite. 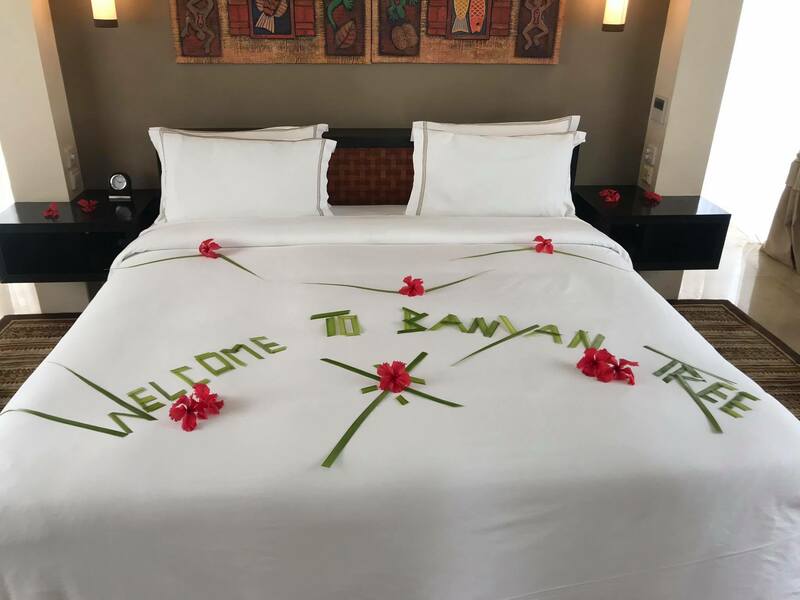 Banyan Tree’s brand promise is based on a low-tech, hi-touch concept. 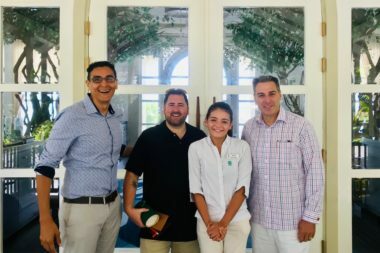 “At Banyan Tree Seychelles, we believe that anticipating CIRE Travel’s guests’ needs and being detail-oriented are our guiding principles, and we are committed to give them a very memorable experience in the Seychelles,” promises Fabrice. The reality is that there are several destinations on the planet that could qualify as paradise. What makes Banyan Tree Seychelles so magically unique is first and foremost the staff and how each team member seems to make it his or her sole purpose to make guests from CIRE Travel feel particularly welcome.